You, as pirates, are now embarking on an exciting treasure-hunting adventure, using mainly your brains! 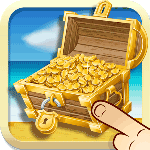 On each level of the treasure map, direction arrows will appear to guide you where the treasure is on the map and you should analyze and decide where to dig accordingly! Your mission is to dig out as many treasures as possible within 180 seconds! Be careful not digging out bombs and also you have to find the treasure on each map within the indicated number of digs for that map, otherwise, the game is over for you as a pirate! Good luck and enjoy digging out golds and beating your opponents!